Liv Ullmann's take on August Strindberg's classic drama emphasizes the class struggles of its characters, depicting the ways in which power systems drive individuals beyond reason. Unlike the 1888 play on which it is based, the opening moments of Liv Ullman's Miss Julie insists on contextualizing its title character right from the start. Years before the film's main action, a rich little girl (Nora McMenamy) reads aloud to herself about "a glorious doll, so fair and delicate, she did not seem created for the sorrows of this world." The child wanders through her massive, empty country estate in Northern Ireland, bored, lonely, and sad, yearning for her dead mother. She climbs out a window and runs for the woods, laughing but still alone, she finds a glorious doll wedged high in a tree. She smiles up at the doll, weather-beaten and dingy. And so we know: Miss Julie feels abandoned by her mother's death and her father's apparent absence. She's at least a little wild, uncomfortable with her privileged place in life. It's a lot of information for the first two minutes of a film, but effective, even if it's not particularly subtle. We feel sympathy for Miss Julie and we're primed to make excuses for her, however she turns out. 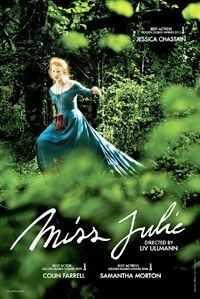 Years later, a grown-up Miss Julie (Jessica Chastain) remains rebellious. She is still climbing in and out of windows, still more herself in the woods than in the house. The bulk of the film takes place in the kitchen, however, and concerns an intense power play between Miss Julie and John (Colin Farrell), her father's valet, with Kathleen (Samantha Morton), John's fiancée, also drawn into the struggle. In the kitchen, John and Kathleen gossip about their mistress, observing her inappropriate behavior (say, dancing in the barn with servants). Their conversations make clear the themes at issue here, from class and gender differences to societal expectation and personal aspiration. For one thing, as John complains to Kathleen, Miss Julie's father, the Baron (often discussed, but never seen here), has given him a folder full of travel brochures. He's incredulous that the Baron doesn't understand that John will never have access to such adventures, being a servant. At the same time, John orders Kathleen about as she fixes his dinner, griping that she didn't warm his plate and insisting she serve him a nice wine. When she jokes that he is fussier than the Baron, John misses the irony. He is conflicted, which means that the women around him will suffer. Miss Julie, too, is conflicted. Just as she is determined to reject her rank and dance with servants, she is also intent on seducing John, partly to act out against her father and partly to act on her attraction to him. Even though she's heard John praise her physically, Miss Julie believes that her class status makes her attractive, and so she wields it like a club. She orders John about, instructing him to l fetch her drinks, toast her, and kiss her boot, literally. For his part, John won't obey her unless she says, "I order you". It's clear he's creating a loophole for himself, an excuse for crossing the line. "But since you order it...", he repeats as he acts against his own better judgment again and again. John is not completely powerless, of course. As the lines between them blur, he is quick to seize any opportunity to degrade Miss Julie, and she, in turn, appears willing to be degraded. It is exhausting and painful to watch Miss Julie and John alternate between attraction and revulsion, submission and coercion. Each is full of cruelty and self-loathing, yes, but the film asks how such feelings might originate. Who is responsible for these desperate creatures? That they often appear to be insane is not an exaggeration, and it is sort of the point. Class and gender systems, as well as religion (represented here by Kathleen), drive individuals beyond reason. In the midst of this indictment, can John and Miss Julie be held responsible for their actions? After all, those with the real power, the Baron and the priests, are nowhere to be seen. We only observe their charges, left to struggle on their own. The kitchen and the tunnels, the heavy doors and gates, become increasingly oppressive, until at last the house resembles a prison or an asylum. While John and Miss Julie seem determined to destroy each other or themselves, Kathleen's response is complicity and preservation, not just her own, but also, crucially, all of their ideological confinements. In her view, she and John need the Miss Julies of the world, to be reminded of their roles, their limits, and their obligations. She is horrified when John claims that Miss Julie is just like them. If this is so, she laments, "Then what are we to aspire to?"